C. Bonnet and C. Morel were individual cycle builders in the 1890s. 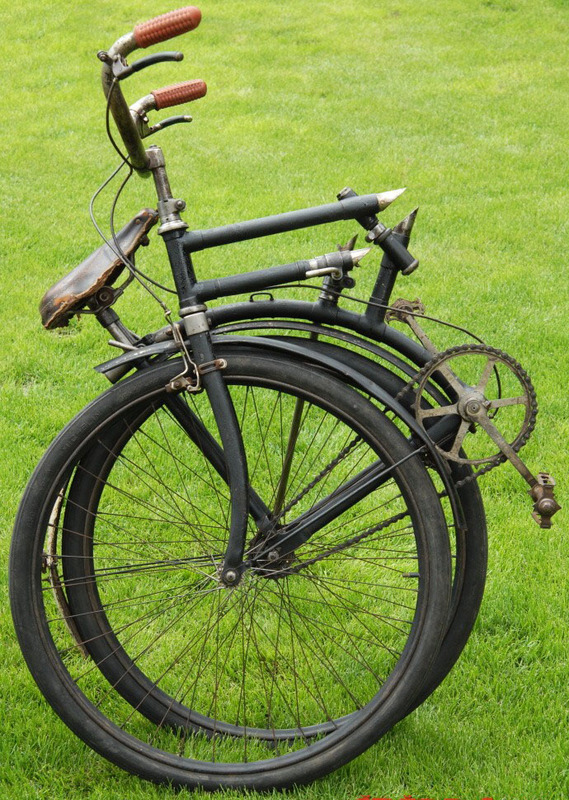 This extremely rare French machine is of particular historical significance because of Charles Morel’s other vehicle designs, namely the Sociable ‘La Victoriette’ automobile, and the ‘Captain Gerard’ military folding bicycle. Charles Morel (1848-1914) displayed an early interest in machinery, apprenticing himself to a mechanic in his native Vienne. Within a few years he progressed to managing small machine shops in southeastern France. He was a gifted inventor, securing seventy one patents during his career, starting in 1874 with a patent for a wool-combing machine. As well as the Victoriette and Gapt Gerard, he invented machines to crush and sift minerals for the cement and lime industries; his machines using steel pellets and centrifugal force are still the basis of many modern crushers. At first, lacking the capital to build his own machinery, he exchanged his patent rights for a portion of the profits from sales, and subsequently contracted firms to build machines under his supervision. These arrangements invariably led to conflicts. So, in 1891, he opened his own factory in the small town of Domene in Isere, and funded his inventions from sales of his machines. A few years later Charles Morel designed the ‘Captain Gerard’ folding military bicycle, subsequently manufactured by Peugeot. His business partner at that time was Capt Gerard. But it was Gerard’s name rather than Morel’s that ended up being associated with the bicycle, so initially it was assumed he was also the inventor. I’m not sure of Morel’s contribution within the partnership of Bonnet & Morel, but the chainwheel on this particular bicycle, illustrated below, contains the initial ‘B’ …for Bonnet. The ‘La France’ is in good unrestored original cosmetic condition. It is sound and rustfree. We recently serviced it, and it’s ready to ride. As can be seen from the above poster, Bonnet et Morel made both sewing machines and bicycles, a combination that was common in the early days of cycle manufacture. Their sewing machines included the Aurore, La France and Le Reve. The poster below illustrates pneumatic tyres advertised by Morel, and below that is a headbadge, believed from 1911, of a Bonnet ‘Imperial’ bicycle.